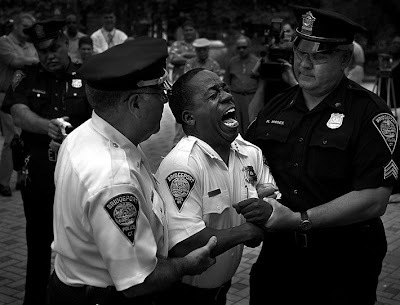 4:18:07 PM: Bridgeport Police Chief Brian Norwood, center, reacts as he gets tasered by Officer Pete Garcia, back left, during a demonstration held outside the City Hall Annex on Wednesday. Lt. A.J. Perez, left, and Sgt. Ray Masek, right hold Norwood up during the demonstration.